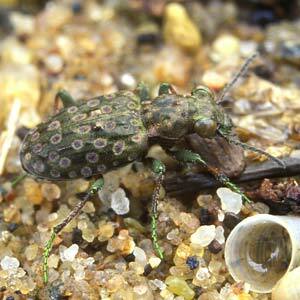 Description: Smallish (6.5-8mm), dull greenish-bronze ground beetle living on open bare mud or sand on river margins and lake shores. World Distribution: A common circumpolar Boreo-temperate species (56) found in northern and central Europe south to northern Spain and north Italy, and across Siberia to northern North America. Irish Status: Widely distributed and common on sandy or gravelly lake and river edges across Ireland. Ecology: A characteristic riparian beetle of sparsely vegetated, sandy, silty or gravelly margins of lakes and rivers. Abundant around Lough Neagh. Often seen running in the sun along water margins and will take to flight under warm conditions. Generally absent from the well-vegetated habitats frequented by E. cupreus although the two occasionally occur together on mixed shorelines. Absent from peaty or upland habitats.